There was a time when video games were not taken so seriously, where you could pick up a PS2 game without knowing what it was and most of the time you could probably enjoy it, while playing Lollipop Chainsaw that is one of the things that I was reminded of constantly. While the game itself isn’t the most outstanding product that has been released in years the one thing that the game does perfectly is that it doesn’t’ try to be like any other game out there. 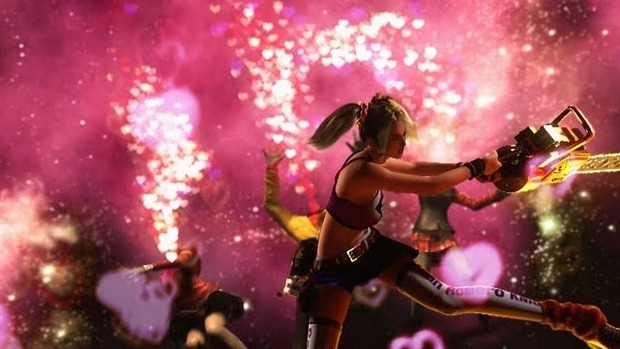 Lollipop Chainsaw is a girly, sugar coated, zombie killing spree that is a campy joy ride to play through, most of the time you will enjoy it but besides the game’s atmosphere there are some problems that may break your immersion. Mowing down zombies with your chainsaw should be one of the funnest things about this game but it’s almost more of a hassle than anything because of the controls. The controls aren’t horrible for this game but they just miss the grade of being good. One of the main staples of combat is dodging the zombies by doing leapfrogs over their heads or jumping out of a fire breathing zombie’s range but half of the time you will just jump right into the line of fire and lose a chunk of your health. Combos are good for the most part but don’t expect to have fluid chainsaw combos right from the start, instead you have to save up gold coins to unlock those moves for later which makes the beginning of the game less satisfying but once you unlock one the feeling goes away. Also later in the game there is a gun attachment that you unlock for your chainsaw that has a terrible aim, most of the times I needed to use the gun to shoot something fast the camera would auto lock onto an enemy that I was not even looking at or sometimes the auto aim made me aim at nothing when there were enemies I was trying to shoot. There are also a number of quick time events that tend to break the immersion, a lot of times you will be in the middle of combat and if you don’t press one of the buttons that pops up a zombie will hit you and even when the button is pressed there is an awkward pause where nothing happens. There are finishing moves where you can smash your chainsaw into a zombie and the ground or you can leapfrog over a zombie and rip them in half but these moves end up being dreadfully long and make you sit mashing one button for much longer than needed. Sparkle Hunting is probably the best parts of killing zombies. The mini games in Lollipop Chainsaw were one of the things that I found to be incredibly fun and refreshing. Remakes of classic arcade games such as Elevator, Pacman and others are found in the game which is a nice throwback. There are times in the game where you have to put your decapitated boyfriend’s head and put it onto a zombie so he can get rid of an obstacle while you cheer him on by pressing the correct buttons. There are even times that you get to mow down fields of zombies with farm machinery while “You Spin Me Round Like A Record” plays that can be a very enjoyable experience. Boss battles in the game tend to use the same formula of once you have cut them in half somehow they multiply or form back together, also all of them have the theme of playing an instrument for a rock band. Despite how short the actual game is there is a lot of replayability in Lollipop Chainsaw too, with difficulties to be unlocked after beating the game and a ranked mode where you can compete online to get the best score. While Lollipop Chainsaw may not be one of the greatest brawler to be created but it is definitely one to pick up. This does strike me as pure, un-adulterated fun, and exactly what I would expect from Sudo 51. After enjoying Sudo’s previous contribution “Shadows of the Damned”, I’ll probably end up buying this too. Good review.